The Varibrush model has a multiple brushing action to allow maintenance to be completed with fewer passes therefore reducing compaction. Designed for fast effective brushing, the Varibrush has four rows of brushes to maximise efficiency. It is essential to brush a synthetic surface on a regular basis in different directions to keep the infill mobile and to maintain consistent levels throughout the pitch. The multiple brushing action of the Varibrush allows the required maintenance to be carried out with fewer passes, therefore reducing compaction. A choice of three mounting options are available for the Varibrush ensuring it can be used on a variety of vehicles. "Brushing is essential. Both to keep the pitches clean and tidy and to stand the carpet up. 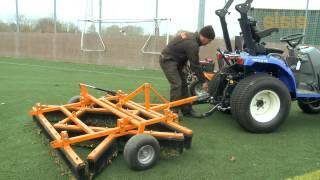 With our SISIS Varibrush the pitches look brand new once they have been brushed."